The industrial control and factory automation market are expected to jump from $155.26 billion in 2017 to $239.11 billion by 2023, for a compound annual growth rate 7.4 percent. This according to the Industrial Control and Factory Automation Market – Global Forecast report by Research and Markets. Prominent trends driving the surge, according to the report, include extensive use of enabling technologies in manufacturing, continuous innovation in industrial robotics, the need for mass production and a connected supply chain, and government initiatives toward the adoption of industrial automation. The report predicts that the Industrial Internet of Things (IIoT) will hold the largest share of enabling technology by 2023. With that in mind, be sure to mark your calendars now for April 18, 2018, when MetalForming magazine will hold its IoT for Metalformers and Fabricators event in Nashville, TN. PFA Mechanical Die Lifters are actuated by hand to the lifted position prior to die insertion and then released to lower the die. They are portable and can be taken from press to press. These units can be used in multiple presses, greatly reducing QDC equipment costs. Replace messy mist systems and improve dry machining with clean, cold air! 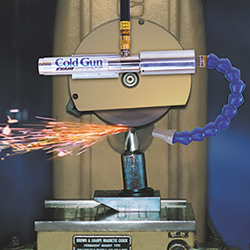 EXAIR's Cold Gun Aircoolant System improves tolerances, tool life and production rates by cooling with 20°F air. The Cold Gun is ideal for tool sharpening, drill and cutter grinding, milling, band sawing, more. The authority on late-breaking metalforming news. Stay ahead of the curve! Hilma offers hydraulic quick die change products with great clamping force control. Experience less downtime, and quickly clamp dies of many shapes, sizes and weights. Hilma systems permit safe, rapid change-over to new production lots. Visit our online catalog now at hilma-usa.com. Wilson Tool's punching division drives the industry with high levels of service, quality and innovation. Offering a wide variety of tooling styles including; thick turret, fab/thin turret, Trumpf®, Wiedemann® and Salvagnini®. 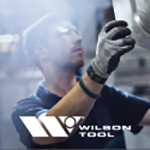 In addition to standard designs, Wilson Tool is known for solving the most challenging fabrication issues through special designs. The Robotic Industries Association (RIA) signed an alliance partnership with the Occupational Safety and Health Administration (OSHA) and the National Institute for Occupational Safety and Health (NIOSH), with the OSHA/NIOSH/RIA alliance focusing on communication and education about best practices in robot safety. "This alliance with OSHA and NIOSH will help us to continue advancing worker safety as more robots enter the workplace," says RIA President Jeff Burnstein. The goals of the alliance are enhancing technical expertise about robotics within OSHA and NIOSH; improving awareness of workplace hazards associated with traditional industrial robots and the emerging technology of human robot collaboration (HRC) installations and systems; and identifying research for reducing workplace hazards. Dexco Coil Racks get your sheet coil off the floor and out of harm's way with generous vertical storage capacity on high-strength shelves with secure customized cradles. Take advantage of organized, easy access, increased floor space, reduced material damage, and improved worker safety with Dexco Coil Racks. Balluff's all new Plunger Probe is a highly durable assembly intended for direct contact applications. 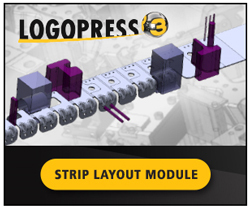 The heavy duty design allows the ability to come in contact with the strip to verify outfeed and for panel vesting validation in transfer stamping. 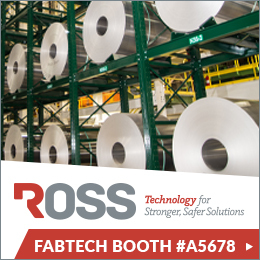 Take a look at the sessions and exhibitors, then make plans to be in Chicago November 6-9. Advancements in automation are shifting the paradigm. MetalForming magazine is proud to deliver what metalformers and fabricators need to know to successfully leverage emerging IoT (Internet of Things) technology. This two-day program in Nashville, TN, allows engineers and managers the opportunity to network with peers and connect with leading suppliers of software, sensors and controls to discuss IoT and plant-floor connectivity. 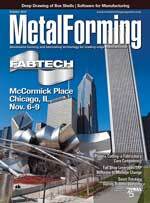 Connecting job seekers and employers in the metal stamping, forming, fabricating and tool & die industries.